the rich and glorious Kerala cultural heritage is reflected in the vibrant Kerala festivals that mirror the ancient traditions, customs, beliefs and faiths of the people of Kerala, South India This web site provides information on basic infrastructure facilities like hotels, travel by road, rail and flight in Kerala. 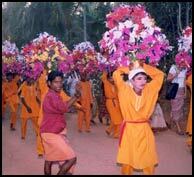 Festivity is in the air, throughout the year, in Kerala. Kerala is a land where festivals never end. Reflections of the varied terrain of the land and the exuberant people, these festivals are usually connected with a temple or some special days. This time be a part of one of the famous temple festivals in South Kerala, where you find the rich tradition and customs of Kerala are followed in its true sense and spirits. It is a spectacular event, combining the majestic elephant pageantry with the frenzied playing of drums and cymbals and rounded off with variety of various temple arts and dances. The main programs of the festival are as follows. 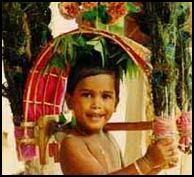 Kavadi :The most potent propitiatory rite that a devotee undertakes to perform is what is known as the "Kavadi".The benefits that the devotee gains from offering a Kavadi to the Lord are a million fold greater than the little pain that he inflicts upon himself. Agni Kawadi : This is the most difficult and rarest spiritual offering 3 persons after after 41 days of spiritual fasting walks through a pit of buring coals. The beating of the drums, burning of the incense and singing hymns in praise of the Lord makes devotee to get into a state of God intoxication and enables him to walk over the live charcoal and attain a supreme state of devotion. Parawa Kavadi: Parawa means bird. 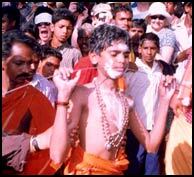 The devotee is suspended in the air like a bird by means of steel hooks on his flesh attached to a movable platform. Mayil Kavadi :Kavadi man dressed as peacocks, resplendent with Peacock feathers and a glittering head-dress dances like a Peacock (Mayil means peacock). Kumbha Kawadi: Kumbham means traditional pot. A group of kavadi men carry kumbham on their head and dance without leeting it falling down . Kuthira kawadi :Kuthira means horse. A group of Kawadi men dressed like a horse and dance. Pookawadi :40 Kawadi men of two groups decorated their head With flower and dance. 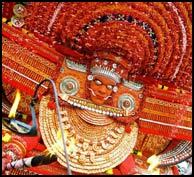 Theyam: Theyam one of the most outstanding temple arts of Kerala has its origin in the northern parts of the state. This ritualistic art demands long hours of preparation before the performance. The theyam represents a mythological, divine or heroic character. The performance is accompanied by the resounding chenda/Veeku Chenda, Elathalam and Kuzhal (Horn). Panchavadyam: Taditional Kerala Orchestra with five different Musical instruments. 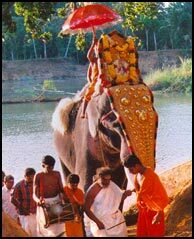 Arrattu: The royal bathing of God’s Idol with elephants at Neyyar River. 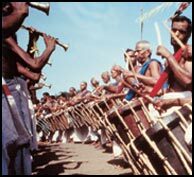 Singarimelam: A group of 20 men carrying tradtional temple musical instruments with playing and dancing. Veil : 18 feets iron rod pierced through the cheeks of the Kawadi men. 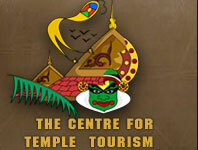 4-3-2013 Stay at Kovalam,Temple pooja,Evening cultural programs at Temple premise and Traditional dinner. 5-3-2013 Stay at Kovalam,Evening sunset cruise at Poovar river and Kathakalli nearest the river bank. lunch and sunset at Varkala Beach. 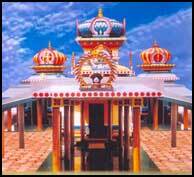 7-3-2013 Stay at Kovalam,Full day trip to Padmanabhapuram Palace, Sucheendram Temple, Cape Comerin. 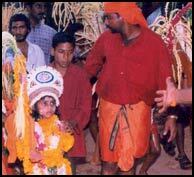 8-3-2013 Stay at Kovalam,Evening pooja and witness preparation of the procession and Dinner. 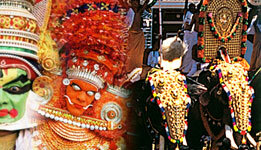 9-3-2013 Stay at Kovalam,Day trip to temple to witness the great elephant festival and procession. 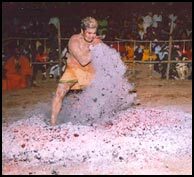 10-3-2013 Day trip to Temple premise, witness kalari payattu, Evening maha sivarathri pooja, cultural show, Dinner. "Every human being pray to the God only for him or her.But a person who will pray for the God,he is the real worshipper".This is reapeatedly pronounced by BRAMASRI KRISHNANKUTTY SWAMIKAL the chief of siva sakithi temple,chenkal ,Trivandrum,south kerala . Everybody may be eger to know about the origin of Swamikal.A great saint was lived in Chenkal 5000 years ago.Swamikal is the rebirth of this great saint .5000 years ago there was a famous Siva Sakthi temple in the bank of the river Neyyar and there was a great saint also lived in this temple.The temple and the entire population was vanished due to an earthquake.The present temple is situatied exactly in this same place where the old temple was situated Bramasri Krishnankutty swamikal was also born in the same place . Swamiji was not a Hindu by birth.But by attaining age one, the boy assumed the name krishnankutty by himself.Since then he used to worship by offering flowers in the natural cage of snakes(Puttu).He spent time by observing deep meditation there.Many times the snake came there to protect the child.On seeing this, the elders removed the cage and the child started laughing on seeing this act.On the next day people saw a very big cage in the same place. Cutting hair of the child is a normal thing.Here the child was born with "Jada" .The parents decided to shave the "jada" of the child the child told that "please ,don't remove my 'Jada' .If you do it blood will come out of this . "But the parents started toremove the 'jada' as he predicted,blood came out .Then they stopped removing the 'Jada'.Today his 'Jada' has more than 7' length. At the age of three,the child started to recite Vegas and Puranas.It should be remembred that there was nobodyin the house to teach him al these classics.He has predicted about his previous life and the old temple,which was there for five thousand years ago,but nobody believed. But at that time a young lady of chenkal was fell ill and doctors told that there is no possiblity of recovery from disease.The father of the lady met the swamy and requested that,"Please help my child to recover from her disease by using your divine power.If she is recovered, then I will construct a temple for you".Swamiji made miracle.The lady was recovered from the disease and a temple was constructed there and that is the present "Siva Sakthi Temple". Now i idols of 'Ganapathi,Shankarji,Devi,Murukan,Nagar etc.are there to workship.Now swami is popular.The number of beleivers coming to the temjple for workship in the daily Poojas,Sivaratri,Processions,Kavadi etc.Foreigners also visits regularly to this temple to witness" The great Elephant festival and procession." This ' Yuga 'is known as ' kaliyuga ' .In this era 'adharma 'is most common .Because of this the individual,family and the society deteriates.Even the nature also shows cruelity to the humanity.Change to this situation is essential.Quality of life should be retain in the sphere of life.One should lead a moral life and that itself is service to the God. In this world people adopt'Bakthi Marga' for retaining the wealth and enjoy world pleasure.But this pleasure is not permanent.When one should offer his entire life to the God ,then only pleasure is possible. 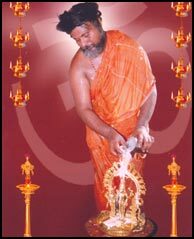 The spirituallity and blessing of God cannot be snatched from anybody.This is self-oriented.Thus by way of spirituality one can get the blessing of the God.But to achieve this goal,if one proceeds of his own way then problem may arise.So a 'Guru'required,Swamiji is giving right advice to his devotees. Chenkal is the cradle of an ancient Indian culture .This place is the culmination of service to humanity and service to God.Swamiji is the living God of thousands of his followers.He welcomes people,irrespective of their caste ,creed or religion.All are welcome to Chenkal to get the blessings of BRAMASRI KRISHNANKUTTY SWAMIKAL.